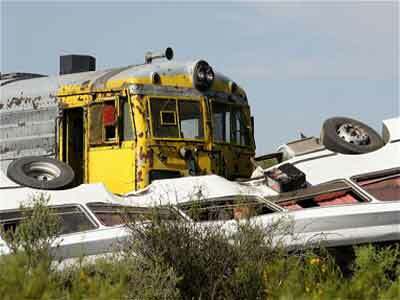 At least 15 people were killed on Monday when a mini-bus plunged off a bridge, landed on rail tracks and collided with a train in eastern South Africa, an official said. Fifteen people have lost their lives,” Kwa-Zulu Natal province health spokesman Sam Mkhwanazi, told AFP. The accident occurred near Shaka’s Head, which is close to the eastern port city of Durban. Netcare 911, a private medical service provider that rushed to the accident site, reported 14 dead and six injured, all of whom were on the bus. “A report from the scene indicates that the taxi (mini-bus) plunged off the side of the bridge and landed in front of a train several meters below the road level,” Chris Botha, Netcare 911 spokesman, said in a statement.